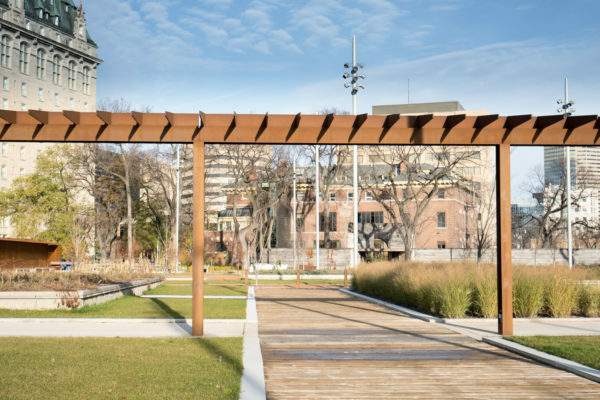 The trellis that divides the park represents the original stone north wall of Upper Fort Garry. 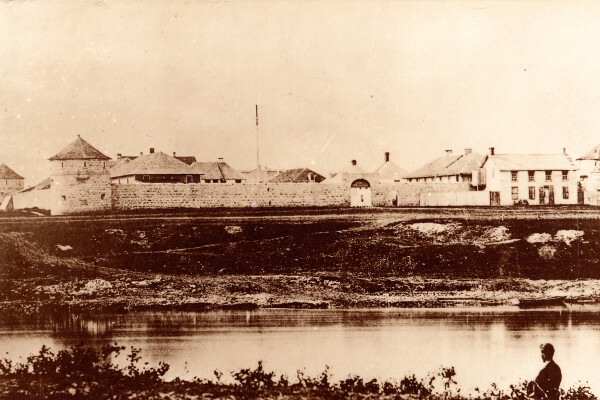 By the 1850s, Upper Fort Garry had come to play a very important role in the fur trade – so much so, that its growth began to spill over the original walls. Consequently, new wooden walls were built to double the size of the fort. Once the extension was completed, the original north wall split the inside of the fort and had to be taken down. This process began around 1852 and continued into 1854. What did the original walls look like? For over fifty years, the fort dominated the Red River skyline. It seemed massive because the original walls were of solid stone 13 feet high and 3 feet thick, and the extension was equally strong, though its walls were constructed with oak timbers. Stone was a useful material because of its strength and durability but it was rarely used in the region. 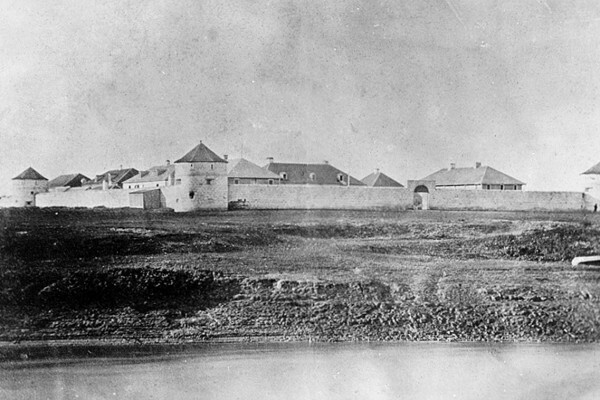 The fact that the original Upper Fort Garry was entirely built out of the material shows how important the fort was to its creator – the Hudson’s Bay Company. Stone was also chosen for its psychological effect. The fort’s solid, hulking walls were impressive and even intimidating. They represented the power, prestige, and dignity of the fur trade company. The fort’s original walls were built between 1835 and 1837 from river cobbles and sandstone which was likely quarried from Bird’s Hill, about 30 kilometers to the northeast. 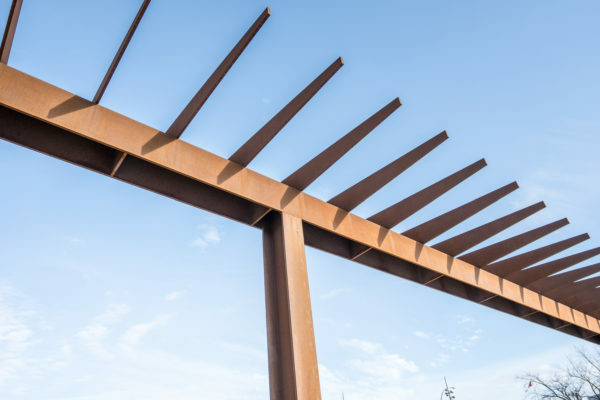 Together, the four walls created a rectangular space which extended 290 feet from north to south by 245 feet. The walls had no battlements and, unlike Lower Fort Garry, no loopholes. The top of the fort’s walls were beveled, meaning they were higher in the middle to prevent the pooling of rain water. A wooden gallery ran along the top of the walls inside the fort, at about eight and a half feet above the ground. 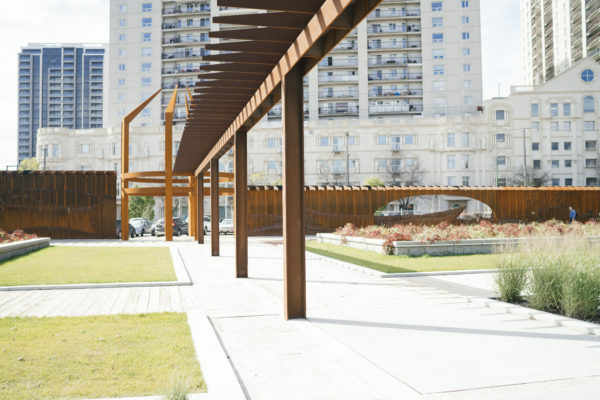 This balcony-like structure was supported by wooden posts placed every 4 feet. The guards which occasionally patrolled the fort likely accessed this gallery through the fort’s bastions. Coutts, Robert and Diane Payment. The Forks of the Red and Assiniboine: A Thematic History, 1734-1850. Ottawa: Environment Canada, Parks Service, 1988. Guinn, Rodger. The Red-Assiniboine Junction: A Land Use and Structural History, 1770-1980. Ottawa: Parks Canada, 1980. Loewen, Brad and Greg Monks, A History of the Structures of Upper Fort Garry. Ottawa: Parks Canada, Microfiche Report no. 330, 1986. Rostecki, Randy. “Upper Fort Garry Gate: 130 Main Street,” City of Winnipeg Historical Buildings Committee, 1991. 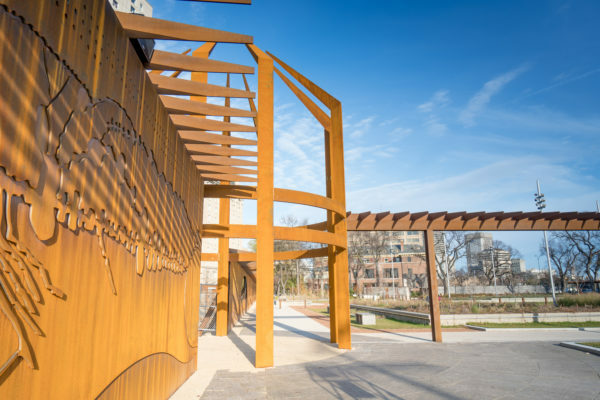 The steel trellis marks the location of the north stone wall of the original Upper Fort Garry 1835-1851.